One of the most gratifying parts of school design is knowing your work will contribute to improving education. But what if the design process itself could be an educational experience? Two recent Fanning Howey projects demonstrate how involving students before, during and after a design project can serve as a valuable learning opportunity and result in a more successful final design. 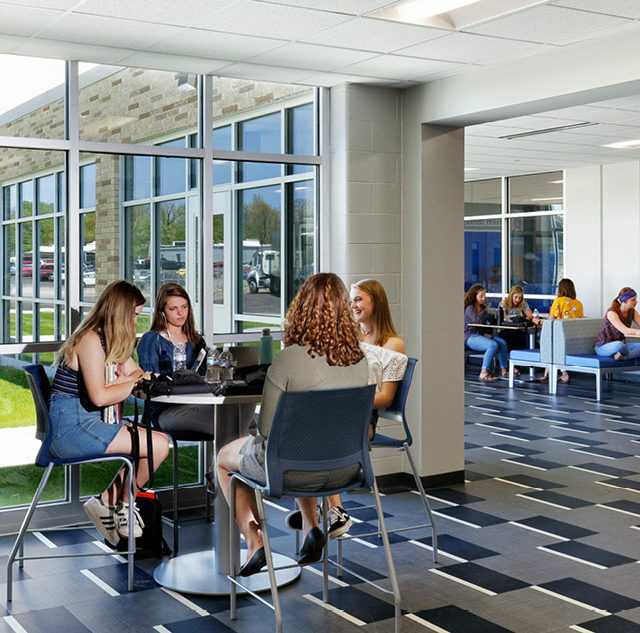 At Batesville High School, Fanning Howey recently worked with underclassmen on a new student commons area for the high school that would serve as a gathering space, connection between levels and new main entry. The commons was envisioned as a place where students could eat lunch, but also get together before and after school for study and collaboration. The multilevel space includes a gathering stair, concession area at the bottom and a learning commons at the top with monitors where students can connect their laptops or mobile devices to share work for collaboration. A committee of freshmen and sophomores was selected by the principal to give design input, as these students would be using the new facility for years to come. We relied on the student committee to learn how they would be using the space and how it could be improved to better suit their needs. As a result, many of the choices made during the design process reflect their input. For example, the students indicated stains and crumbs were a concern on the risers and stair treads because people would be eating there, so they didn’t want carpeting. This led us to put in a resilient tile floor that’s both durable and washable. The committee was also consulted on details like colors, fabrics, furniture selection and layout. They preferred moveable booths with no partitions, and high-top seating to look over the whole commons during meetups. This was all reflected in our loose equipment package and bidding documents. 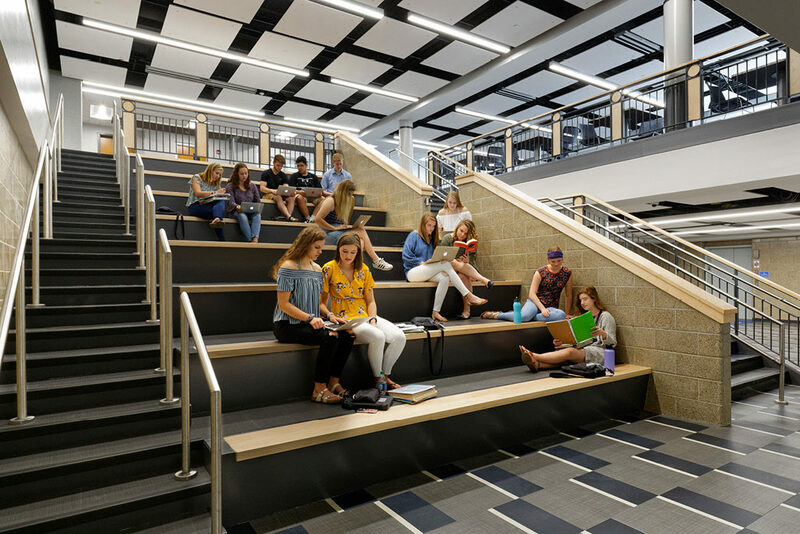 Student input at Batesville High School led to the gathering stair being customized to meet their preferences and needs. We worked collaboratively with the students for an entire year, from conception to the opening of the commons in January. I’ve gone back recently and it’s inspiring to see so many students using the space on a daily basis, knowing they contributed to the concept. The students got to experience how a real-life architectural design process works from the ground up, and in the end, we arrived at a stronger design solution as a result of our partnership. Even when it’s not possible to have students involved in the design process beforehand, projects still hold the potential for hands-on learning. At Penn-Harris-Madison High School in Mishawaka, Ind., construction is underway on a new stadium building with locker rooms, expected to open this fall. With 13,000 square feet of space, it holds a lot of room for creativity to flourish. We partnered with Josiah Parker, the school’s architecture teacher, to work with his architecture students on developing their own designs for the new stadium as a class project. Using the same visualization technology we employ during the design and presentation process, we were able to walk the students through a virtual model of the building to see how their own creations could be implemented. The architecture students made presentations of their designs, and we evaluated their work. The ability to present your ideas to a client and obtain feedback is an often overlooked part of an architect’s skillset, and it gave these students a head start on bringing their designs to life. Involving students in the design process is rewarding and, with Batesville as proof, can even lead to a more successful final product. No matter how many school projects I’m a part of, there is always something to be learned from each district’s unique student body, and it is inspiring to show them how their own ideas can become reality. As architects (especially school architects), we have a responsibility to help teach and inspire the next generation, while learning a thing or two ourselves in the process.